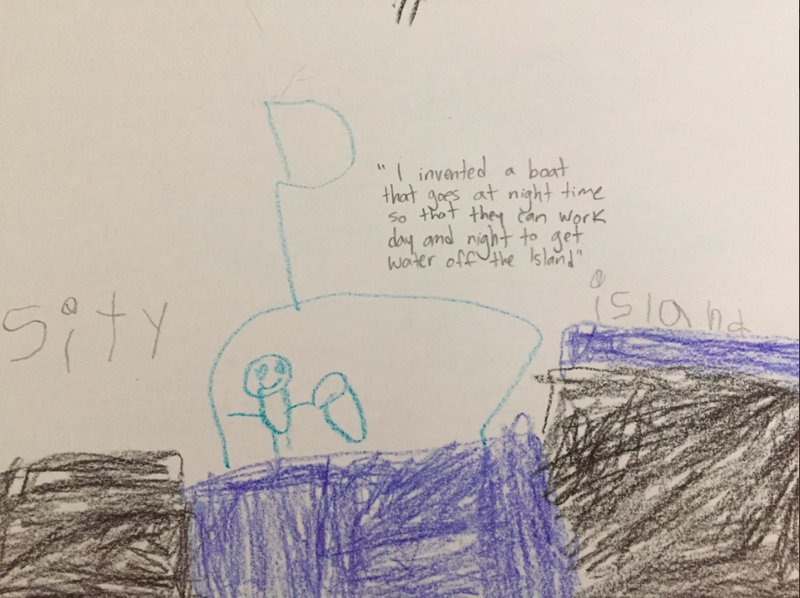 Wide Eyes and Wonder: A Journey in Relocation: What "Makes" a Classroom? Hello! I hope all you educators are currently having a well-deserved, relaxing, and enjoyable summer. I know it's been a bit since I've posted here, but those of you who have been following along on Twitter know that our end of the year was quite busy (and exciting!) to say the least. Due to the flooding on Toronto Island, our school was evacuated mid May and relocated to a city-side school downtown. Long story short, we had about 2 hours to pack our bags with "everything you need for the rest of the school year". I think I spent about half that time pacing the classroom, overwhelmed with where to begin. That being said, I'm not here to blog about how challenging the re-location was. We quickly realized there was nothing we could do to change the situation with flooding on the Island, and we committed instead to staying positive and doing whatever we could do to ensure a smooth transition for our students. I'm a big believer that students pick up on the energy you put out, so it was important to me to stay positive through this unexpected transition. In fact, despite the challenges, I'm quite thankful for the experience. Walking into an empty classroom mid-May with 26 eager, curious, and energetic students ready to go was an eye-opening experience for all of us. 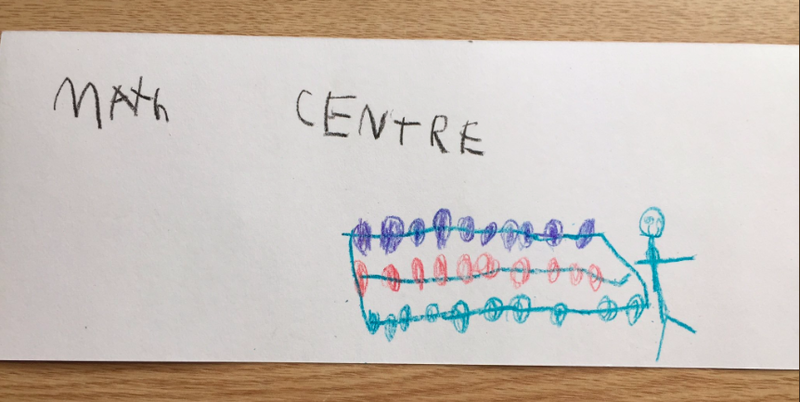 The entire process really helped me to learn and reflect on the idea of "what makes a classroom", as my ideas and understanding about early years education transform and grow. 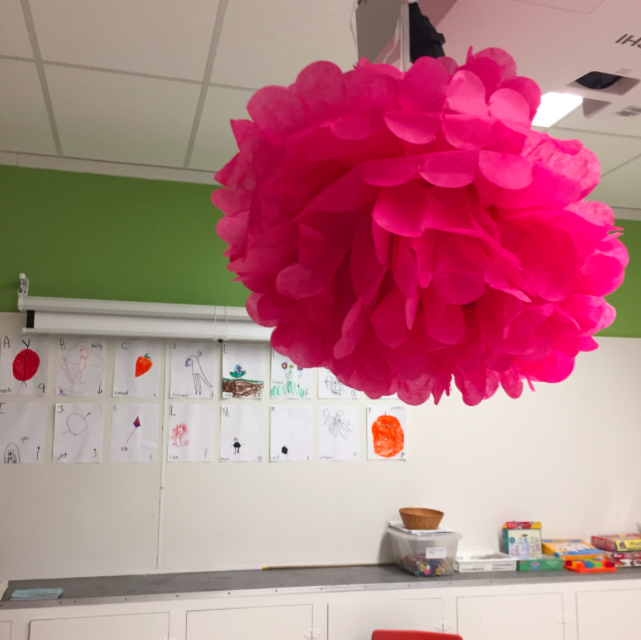 Through this experience I have high-lighted some major perspectives I feel are important to consider when we design spaces for learning, engagement, and well-being. We were quickly settled at a downtown school that happened to have some rooms empty for us. As you may know from previous posts, I am big on the idea of classroom community, so it was natural for us to start this experience in a circle, talking about our feelings and ideas. To me, this was much more meaningful and a better use of our time than me rushing around and setting up the new space for the students. After a community circle where students openly shared their feelings about leaving the Island (scared, nervous, excited, confused, etc.) 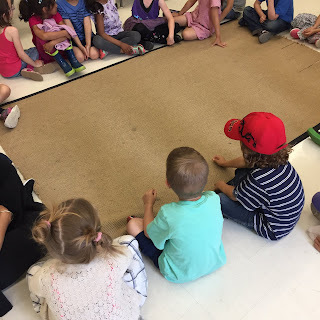 we broke into small groups to give our opinions about what our new space needed. 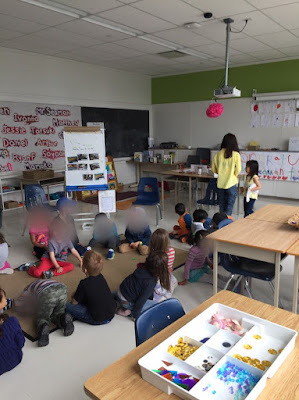 As an educator, it was a really interesting experience to see what students deemed "important" in our space, and what areas from our old classroom they really connected with. I anticipated some of the students' ideas, but some caught me by surprise and I was thankful to have their voice included in this process. They thought of some things I would not have, and after all, I am a big proponent that our space belongs to ALL of us. And with that, we got to work. Including the students in the process of not only brainstorming, but creating, our new space was also an effective use of time in our early days of relocation, when we were still waiting for our packed boxes of materials and furniture to arrive from the Island (thanks TDSB Task Force!). Something that emerged in student brainstorming was the need for more colour and art on our walls in the new classroom. 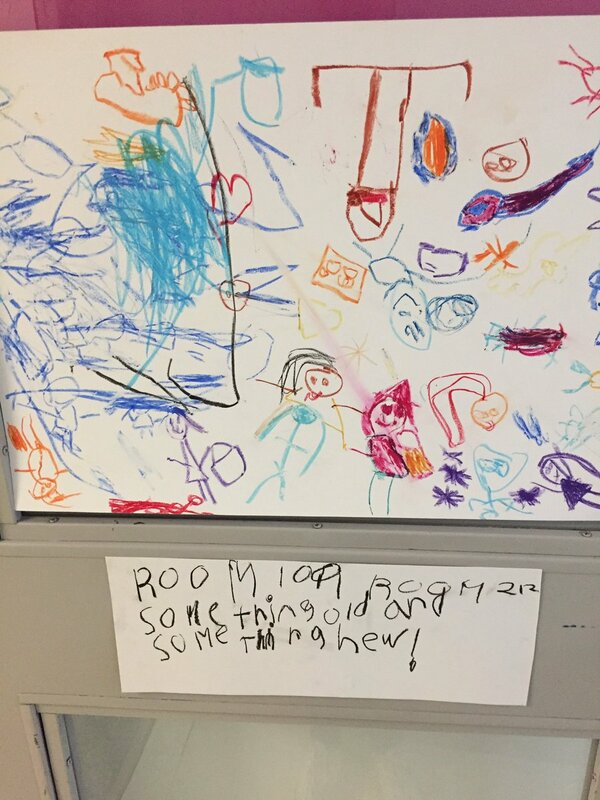 We created the collaborative piece you see above, and used our ongoing exploration of rhyming words to create a new community chant! We were Room 109 on the Island, Room 212 in our new space, and wanted to honour both the old and new things we were filling our space with. The students really took to this new, but quickly familiar, daily chant. 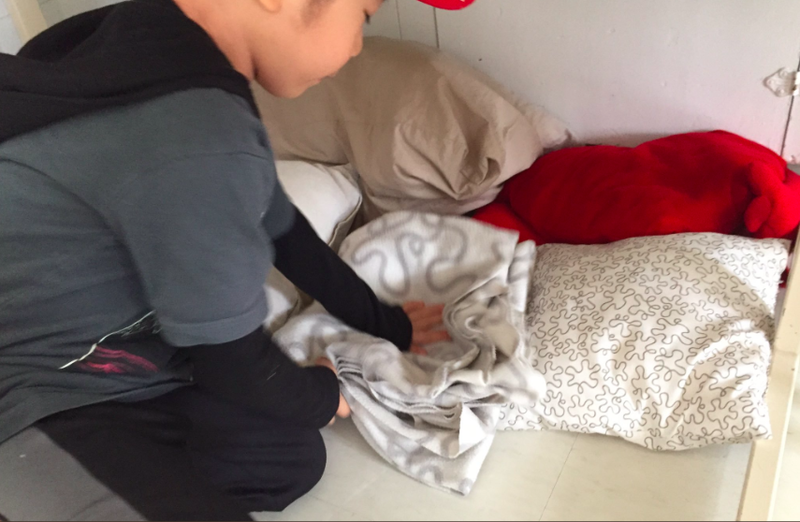 We would start every day with it, which was important as it gave students a semblance of routine in this time of change and unpredictability. Check out the video below! As more and more shipments from the Island school arrived citywide, students used what they found to continue co-creating areas for play in our new space. It was striking to step back and observe the independence students demonstrated and the ownership they had over their experiences as a result. While creating new areas was a focus, we also wanted to ease the transition of relocation by honouring old and familiar items from our Island space. So many things were going to be changing around our young students (no more boat! so many staircases! ), and a conscious effort was made on our part to bring along some things that would provide a sense of comfort and familiarity to our students. 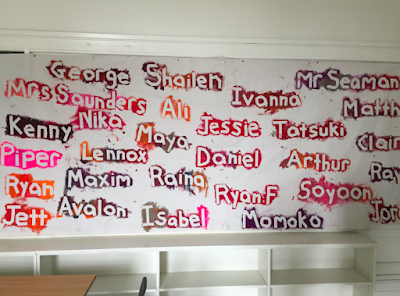 Our community name banner, a yearly Room 109 tradition, made the trip to the city with us, and I still remember the smiles and cheers when students came in after lunch and saw it hanging on our new wall. It made me stop to think about how a community is still a community, no matter where you may be. As well, we knew we had to bring our classroom disco ball along, as daily dance parties are another Room 109 tradition, which we happily continued in our new space. While none of this was an ideal situation by any means, being purposeful and thoughtful about how we were co-creating our new space helped to ease the transition. While students continued to miss our old space, they also took pride over our new space - because they were so involved in the process. 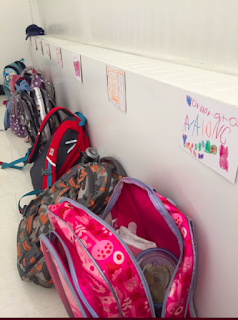 Students even started bringing items from home to spruce up our space! With a month and a half to go in the school year when this relocation occurred, we also knew that we had to think about more than just setting up the new space. 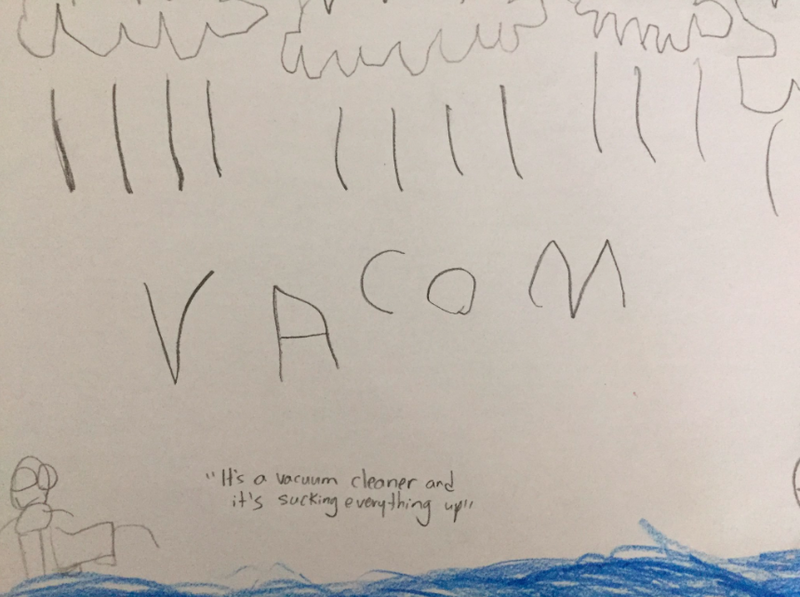 It was our responsibility to continue to ensure that meaningful, hands-on learning was occurring even without all our materials, furniture, and resources. 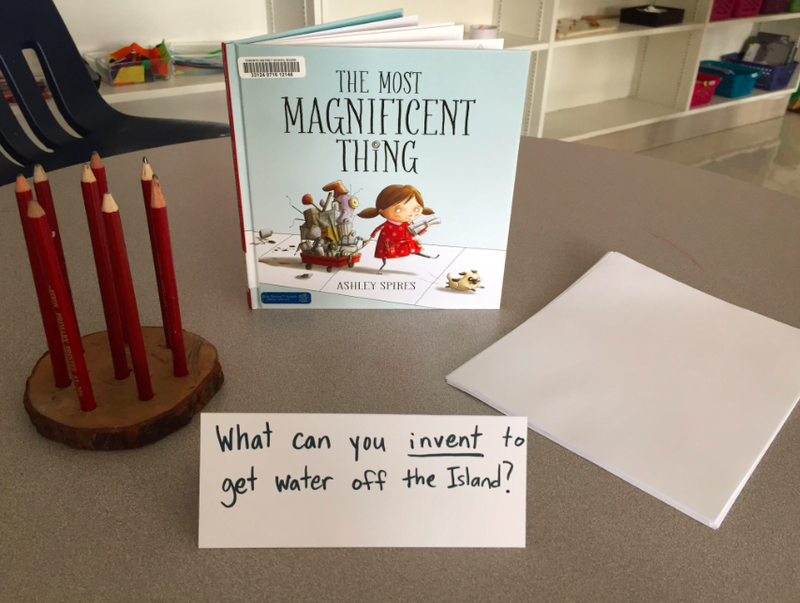 As believers in the power of inquiry based learning, we turned to our unique situation to inspire student authentic engagement and thinking. 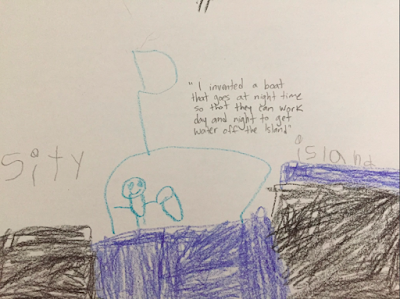 Among other invitations for learning, students spent some time in May and June considering how to help get water off the Island using a STEM lens and several supporting read alouds. Due to the relevance of this topic in our students' lives, it was something they really took to. Meaningful: This experience helped me reflect on what I was putting out, and why. I feel strongly that when it comes to materials "less is more" - and what better time to explore that concept when still waiting for your boxes of materials to ship from the Island! Not having lots of "stuff", meant that we had to be very thoughtful with what we did present to spark learning, and how we did it. Nothing was put out "just because", and as a result, we observed engaged students. With limited furniture, we also had to get creative. This space was used primarily as an adult education room, which meant desks almost as tall as the Kinders themselves! 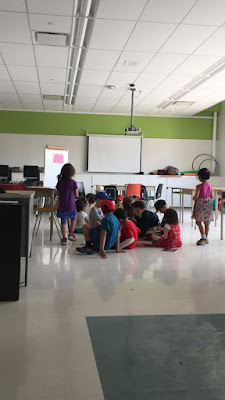 What was neat about this was that our centres almost became dual purpose - with students standing up and working at desk level, and students below the desks, engaged in floor play. While I would have loved for all of our lower tables from our old space to materialize here, we made due with what we had, and I think that is so important in what makes a classroom. Responsive: Classroom setup isn't just a start of the year thing - a classroom should change, grow, and adapt alongside the learners within it. That also means highlighting things in our own practice that aren't working, and making those changes. A phrase I love it "I used to think, but now I think...". There's nothing wrong with admitting that something we tried didn't work, and a huge power in shifting our views. For example. like many, I have displayed our markers, crayons, and pencil crayons sorted by colours. For whatever reason, this specific group of students this year were not responding to it, and I found myself having to give constant reminders as well as sort them myself during tidy up. With this in mind, I looked at this transition as a perfect time to try something new - not sorting by colour in our new space. Students didn't really notice, which showed me that maybe this was an idea I was clinging to "just because". 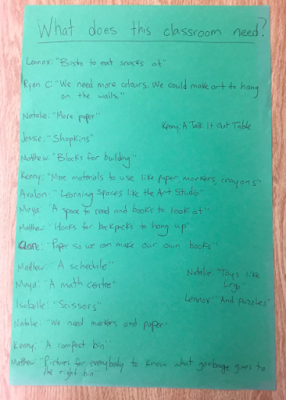 I may try it again with future groups, but for these students, I needed to be responsive to them in how I displayed materials in the classroom. Co-created and Familiar: The biggest piece I hope to showcase in this blog post is the power of involving your students in every step of creating the physical space. From brainstorming to creation to upkeep, student thinking and action took centre stage. The result of this was pride and ownership over their space, which directly translates to their learning. Honouring student voice ensures we are truly a community. Also, having things that are familiar to the students - artifacts or traditions within the community (i.e. 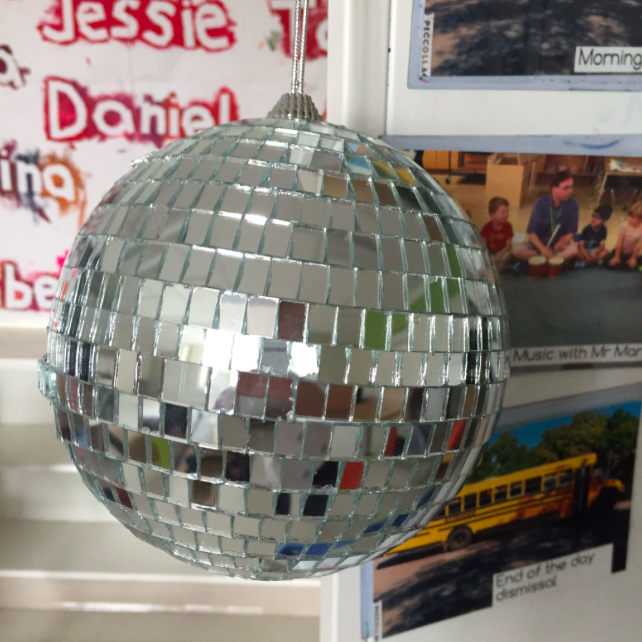 our name banner, disco ball, rainstick), help to create a space where students feel safe, and honours their well-being when unexpected transitions do occur. Before long, my teaching partner and I stood back and were amazed at how resilient our students were being despite this major change in our school year. The space we were in was far from perfect, but it was ours - and it really felt like that. I always feel so bittersweet at the end of the year as we dismantle the classroom. I didn't expect to feel it this year, in this new space, but in fact I did - and quite strongly. Our students had put so much love and effort into the space, in such a short amount of time, and I unexpectedly had tears in my eyes as we packed it all back up in late June. 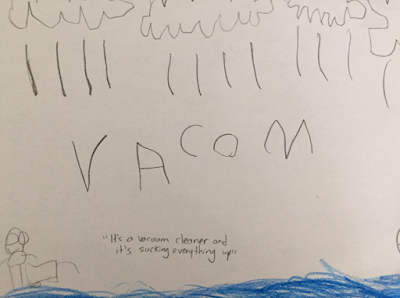 In closing, I implore us all to continue thinking about what "makes" a classroom. Yes, aesthetics do, and should, play an important role - but there are bigger ideas at play! As wild as it was to relocate in May, I am thankful for this unique experience and how it helped me to continue focusing my thinking towards these ideas. 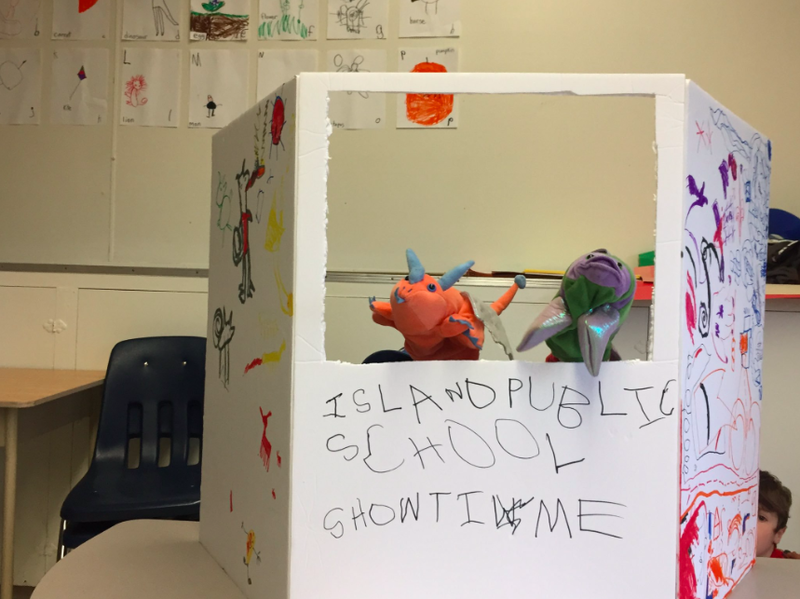 That being said, I am excited to be back in "our" space on the Island come September and to see how this new learning impacts our classroom setup then. Here's to life-long learning! I followed your adventures on Twitter and am so happy you shared your story here. Will be sharing this with our student teachers to talk about what makes a classroom. Thank you! 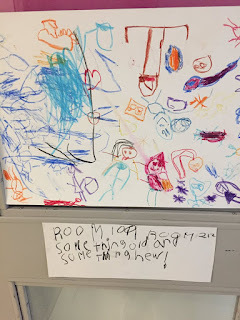 Thanks @JoelSeaman for reminding me about my years in K. This brought back fond memories of my students being given ownership over their space. I believe these lessons are not just for K educators but all educators. It also reminded me about always keeping an open, positive perspective as you have done so well in a time of intense stress for adults and children! Remember that you and your fellow educators have set the conditions to make your students able to lead this classroom transformation. 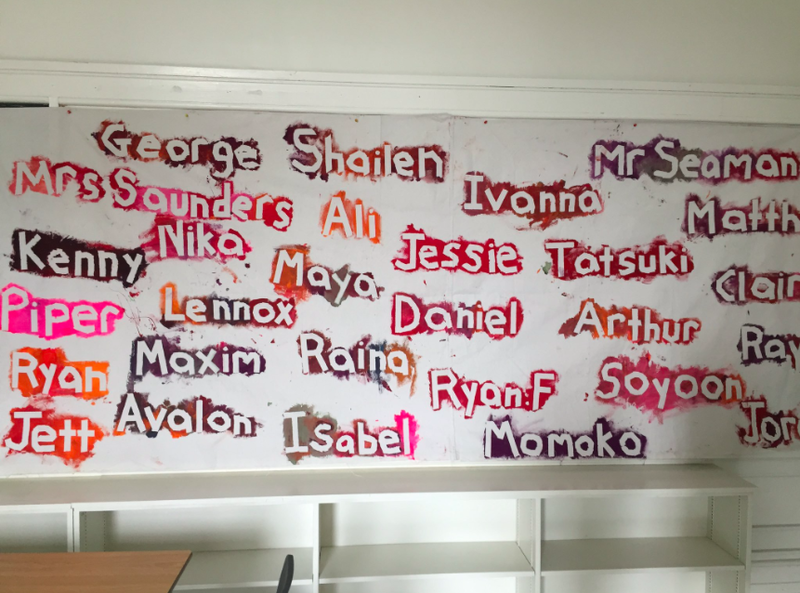 When you asked them what the class needed they knew the most important parts of their former classroom that YOU provided/modelled/co-created for and with them. What an incredible example of gradual release! It also made me think about self-regulation. I imagine your determination to present calm to the students was a huge part of them being able and ready to happily accept and engage in your new space. Well done! Best wishes for a restful summer before next year gets into full swing.